Watching the Olympics tonight showed the difference winning and losing can make. 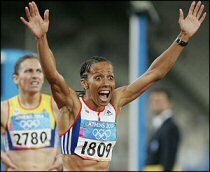 Kelly Holmes in the 800m was magnificent, and the shock on her face will probably be all over the front pages tomorrow. That she only decided to run this race last week was surely a bluff, no? Contrast her win with Paula Radcliffe last night. At first I felt she had let herself down in the way she had ‘given up’. In hindsight that was harsh – the conditions were tougher than I had realised. I would have struggled to walk never mind run a mile in that heat. To see her still upset today and admitting she was baffled as to her loss of form shows just how difficult it is for her to even understand what she went through. I thought last night it was an odd time to run a marathon as I always remembered from previous games that it took place in the early morning. It’s no surprise to read today that it’s believed the run was held in the late afternoon for American TV. I guess we’ll never know how different the outcome would have been if it had started 10 hours earlier. Unfortunately for Paula, it’s just a job and she failed. An HGV driver does not stop and break down in tears because he cannot reverse his vehicle into a parking space. She just wasn’t good enough, she obviously didn’t anticipate the conditions in her training. Kelly Holmes rocks though! which planet is anonymous on? A lorry driver is even prevented by law from working too hard. If it takes the same dedication, drive and desire to be a world class athlete as to be a lorry driver, how come there’s a only few hundred athletes at the olympics and millions of lorry drivers worldwide? The analogy is facile and insulting in the extreme to the talented men and women who are giving their all for their country. She just wasn’t up to it. It’s a job, not a divine right. Gotta agree with anonymous. She’s so upset ’cause she expected to win, everybody had told her she’d win and she beleived it. When she went to fourth and realised she wouldn’t win and then gave up. No problem with that but then having the cheek to hold a press conference!!! Who does she think she is? I don’t give a stuff what she has to say, lets hear from somebody who actually won something. And all this will she/won’t she in the 10K? Who cares. If you want to run, run, if you don’t move aside and let somebody who wants to the chance. Pathetic. The sycophantic/zenophobic BBC reporting didn’t help her either, that’s why we wince at americans and sport, we don’t want to be tarred with the same brush. Thank god Kelly Holmes did win, as it gave the press something to write about, otherwise the feeding frenzy would have been even more nauseating. TBH I’m not bothered that Paula gave up when she wasn’t going to get a medal, esp. if it increases her chances of getting something in the 10,000. I don’t want our athletes over there to ‘take part’, I want them to want to win (says the chocolate munching couch potato!). I can’t deny Paula wasn’t up to it on the day, but nobody gets that distraught if it’s just a job. I don’t invest my whole life in my job and I bet anonymous and RickyD don’t either. You don’t even get to compete at the olympics unless you put everything into it for years beforehand. The press love the story because it’s yet another classic British heroic failure. Others didn’t get medals and were hardly commented on. They just didn’t fail as spectacularly as Paula. Of course we all want to see winners, but I bet in 2008, as well as the success of Khan, Hoy, Pinsent, Ainslie in Athens we’ll be talking about Paula Radcliffe’s marathon run. As for sycophantic/zonophobic reporting we’ve clearly been watching different BBC coverage. You’ve got commentators who’ve actually been there, who are genuine and say what they think. Makes a great change from listening to politicians.